Here Comes the Plant Car…. Berries Being Planted! 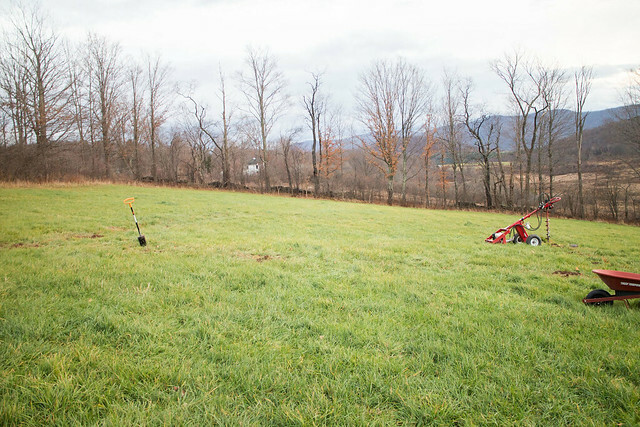 P+M Upstate Adventure: Planning the 2016 Garden – Check out our layout! 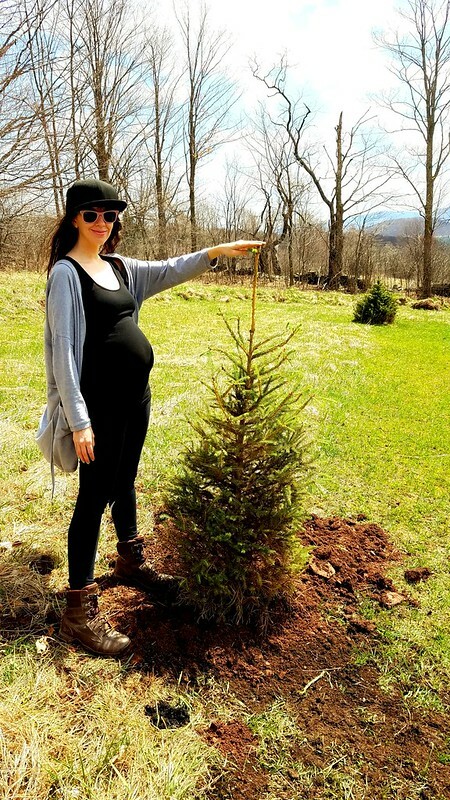 P+M Upstate Adventure: Planting Our Christmas Tree! 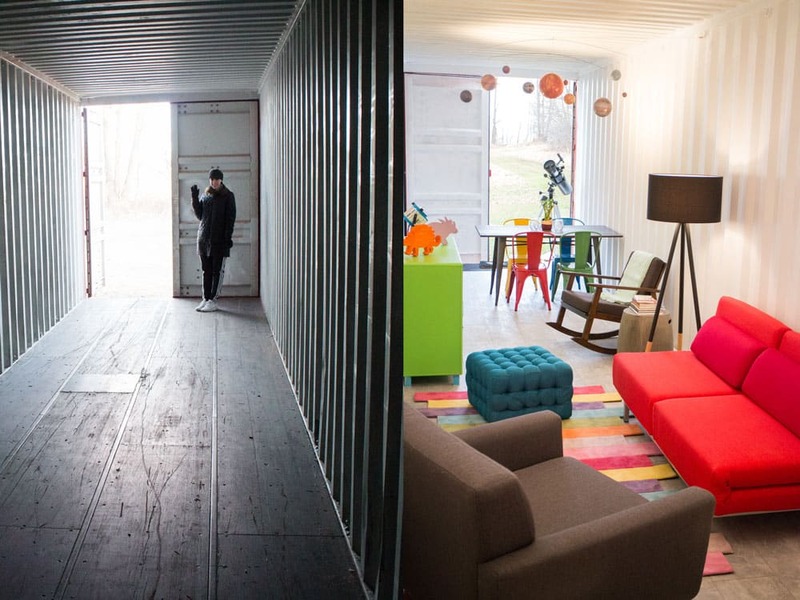 Check out the BEFORE and AFTER of our shipping container home! 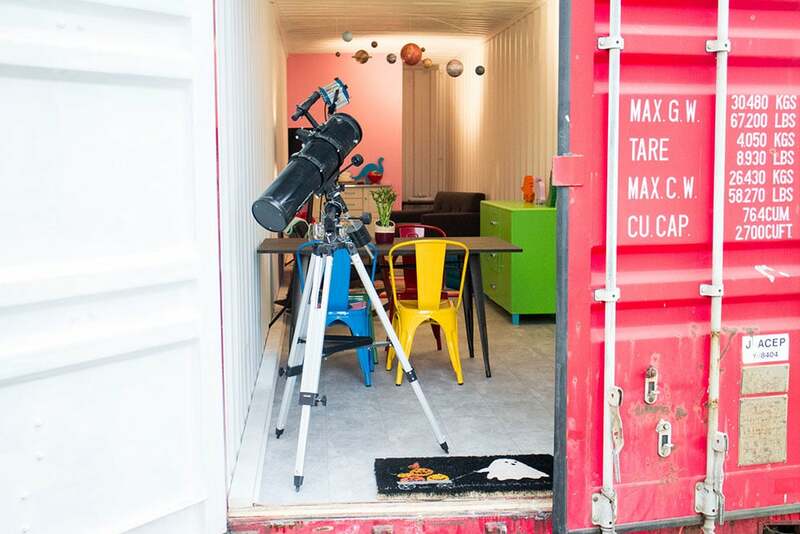 With hard DIY work, we turned a used shipping container into a tiny house. 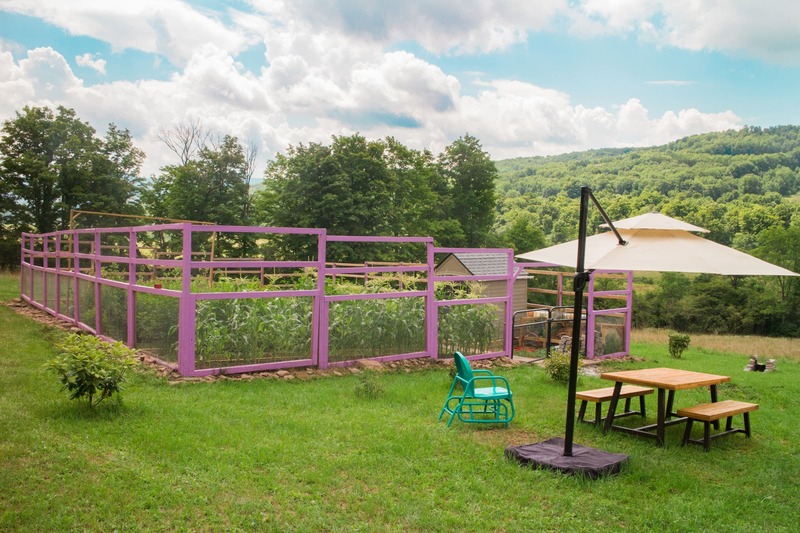 The shipping container sits on 7 acres of land in Upstate New York next to our vegetable garden and green house. With fresh paint, new flooring and colorful furniture we were able to make our dream vacation home on a small budget! Remember when we bought the raw shipping container? Remember when we painted the interior of the shipping container? Remember when we redid the flooring of the shipping container? Well you guys……it’s done (for now!). Here’s our Shipping Container Home Reveal! A quick little note about the project if you’re a new reader. 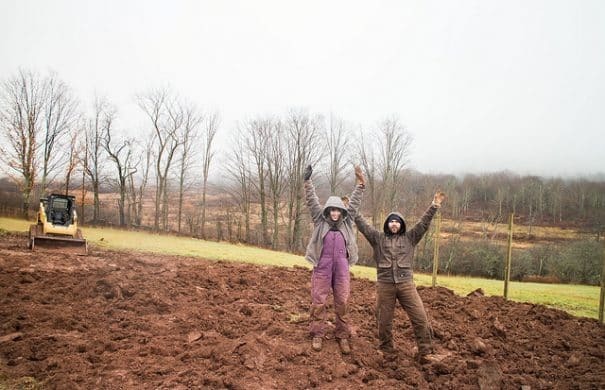 We bought land in Upstate New York to build a eco friendly weekend home. We’ve always been interested in recycling a shipping container to use for a Summer getaway, so that’s what we did. 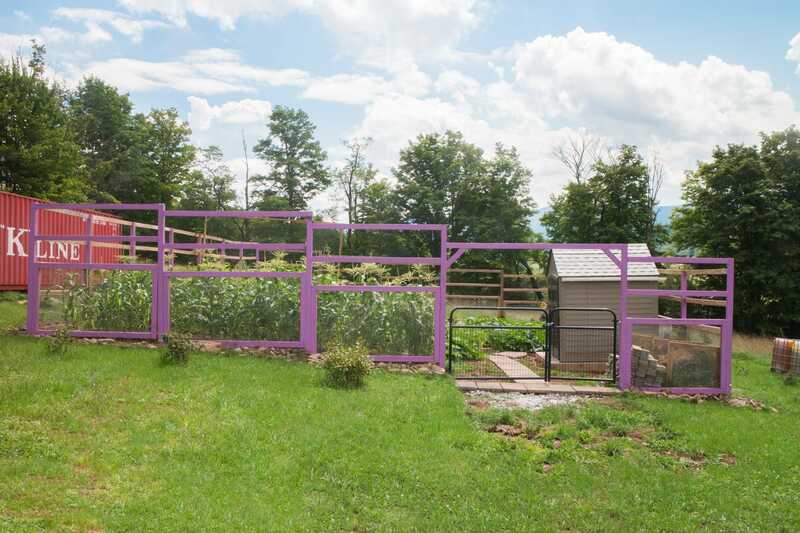 The shipping container sits on 7 acres of land, next to our vegetable garden and greenhouse. The goal of this project was to make a simple, economic getaway so we could run away from NYC on weekends and unplug. The entire project took about a year and a half but it would have went quicker if we didn’t get pregnant and have a baby in the middle of it! Also Winters are brutal in Upstate New York so we didn’t get up much during those months. We have thoughts of expanding the shipping container into 2 or 3 stories and making one side of it all glass windows but we’re still unsure of our next step. For now, it serves it’s purpose so enjoy the reveal! Thanks to Hayneedle for working with me on this project! So cool!!! I can’t wait to read the next in the series. 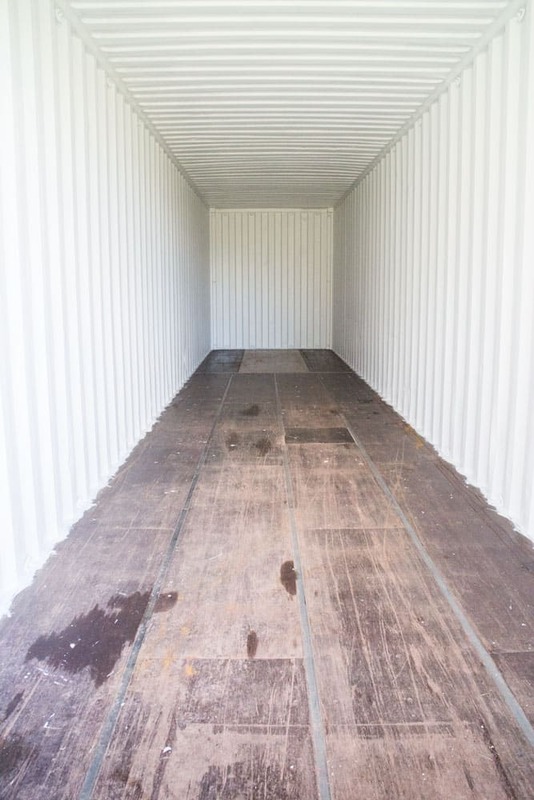 How to remodel a shipping container’s floor to make it move in ready. Find out how to easily refinish the floors on a budget to turn it into your modern dream home! Great design inspiration and cost info for your shipping container house! It’s been a few months since I last posted about our Upstate Adventure and what’s going on with our shipping container! As some of you might remember we bought a shipping container to turn into a vacation home. First – we painted the interior – what a difference some white paint makes (life motto!). 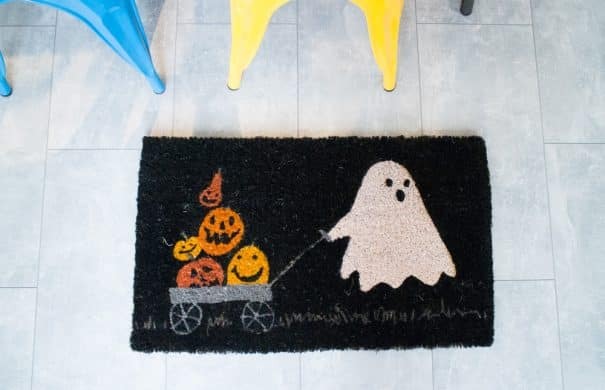 But how about those ugly original floors…?! Well it’s time to redo the flooring to make it safe and move in ready! 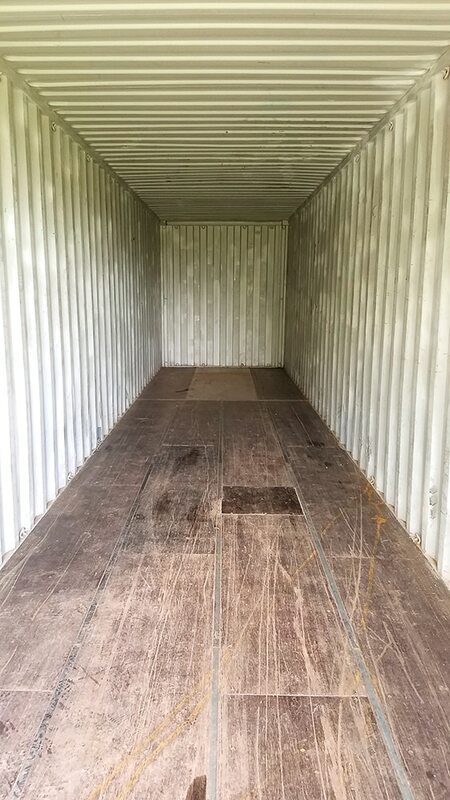 Our container has traveled around the world (literally – you should see it’s travel logs that I downloaded) so you can imagine the flooring had some wear and tear to it. We decided to go with a used shipping container instead of getting a brand new one because we were on a budget and we aren’t scared of DIY projects. In fact you might even say we like DIY projects and look forward to our weekend escape of getting our clothes dirty. What a difference a fresh coat of white paint makes in the shipping container! It’s been a bit since I talked about the next plans for the shipping container. 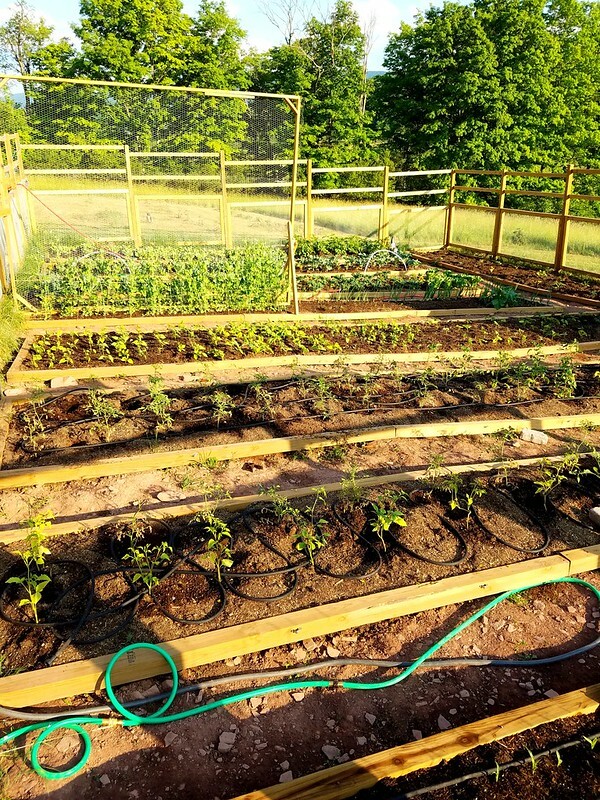 This Summer has been dedicated to getting the garden up and growing, with little time to do anything else on the land. With Fall arriving, we’re going to be spending some time getting the shipping container live-in already. 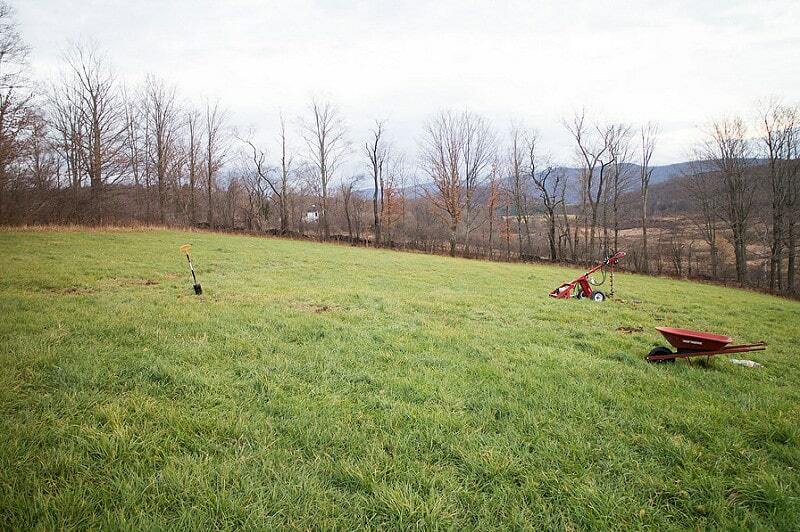 If you guys didn’t read, Matthew and I bought some land in Upstate New York to build a weekend getaway. We got a shipping container delivered to turn into a house. We have big dreams, but we need to take baby steps due to time/budget. For the time being, we’re making it pretty and cozy to spend our weekends in as it’s a bit of a mess now. We bought the shipping container used because it was much more economical that way. Even though we will have to do extra work, I definitely think it’s worth it for the price difference. In the next few weeks we’ll be working on walls, flooring and doors. First up is painting the interior of the container as it was dirty and had lots of marks due to cargo it spend lugging over the past few years. Eventually the shipping container will be insulated, so this is a temporary solution to making it feel like home while cleaning it up. 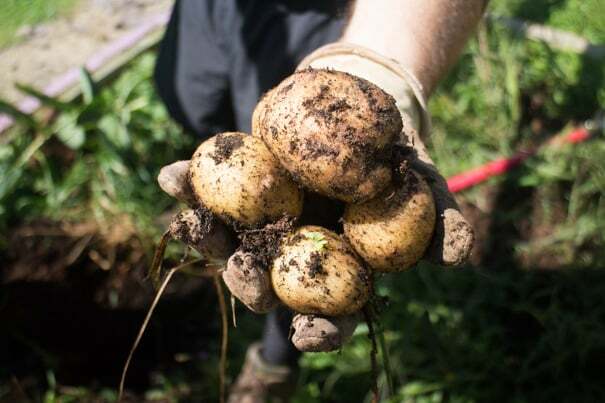 It’s that time again – time to harvest vegetables from the garden! And it’s time to show you the reveal of the garden, well it’s not really a reveal because it’s not 100% done (still has to be painted and cleaned up) but here it is, in all it’s vegetable glory! I should have a person in the garden for size comparison, because it’s big. It’s really big. There’s endless amounts of vegetables. I love it. 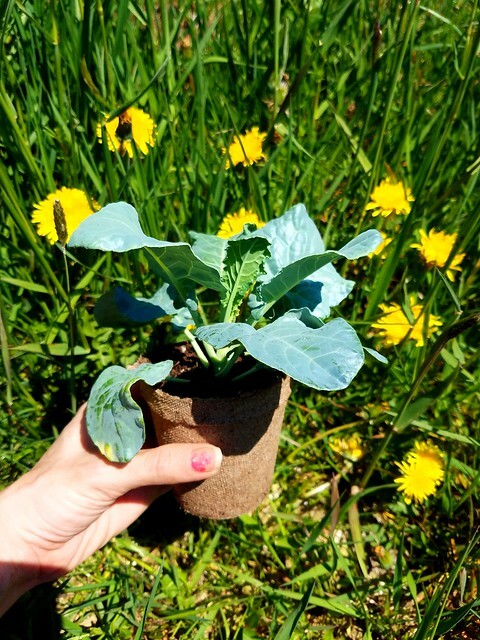 Transitioning from growing on the roof to growing on actual land has been a learning process full of hard work. We started the process of building the garden during the Winter to have it ready to go for Spring. We started planting to a new schedule that was scary due to possible surprise frost dates (still scary). We battled (still are) water issues. We’re learning. We’re working really hard. We filled the last garden bed this weekend. 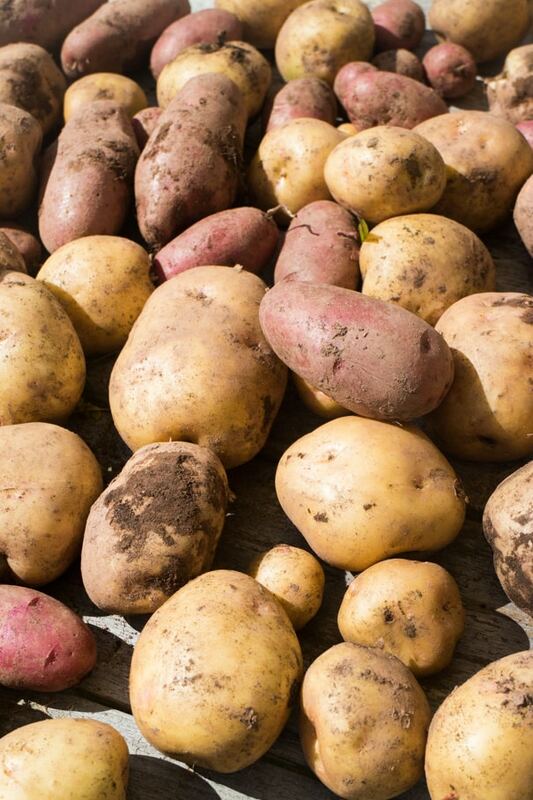 And it’s all so very exciting because we’re finally picking vegetables. This garden thing (on land!) is actually working. So now starts weekly harvest posts. 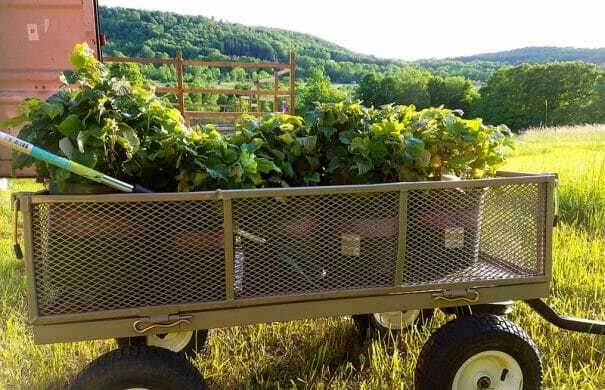 We go up to the land once a week to water, clean up, plant and pick. And then we lug all those beautiful vegetables back to NYC. 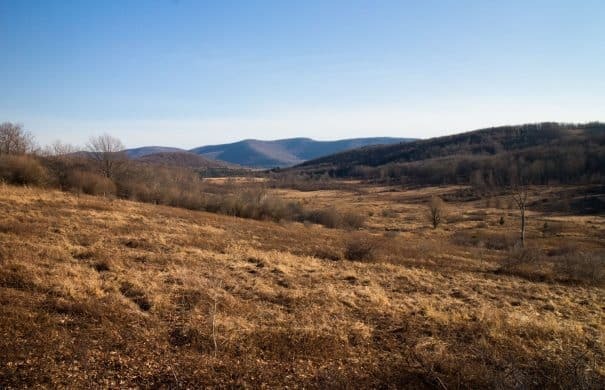 We haven’t really had a chance to enjoy the land yet as we’re working constantly there, but soon enough we’ll be able to take a breather and relax alongside the plants. What are we picking now? I’m glad you asked. There’s lots of Spring greens growing right now at rapid speeds and they’re all ready to be picked. Does anyone need any bok choy? Seriously. 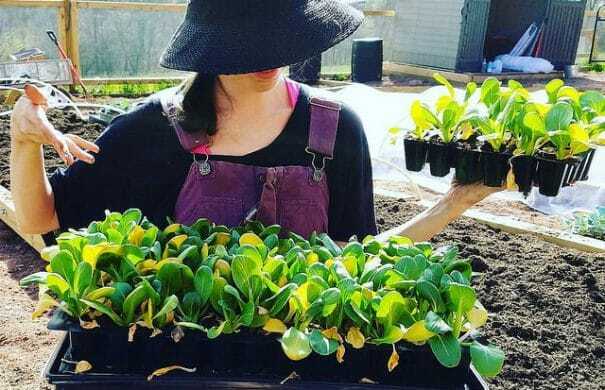 Maybe I went a little crazy planting 94 bok choy plants. 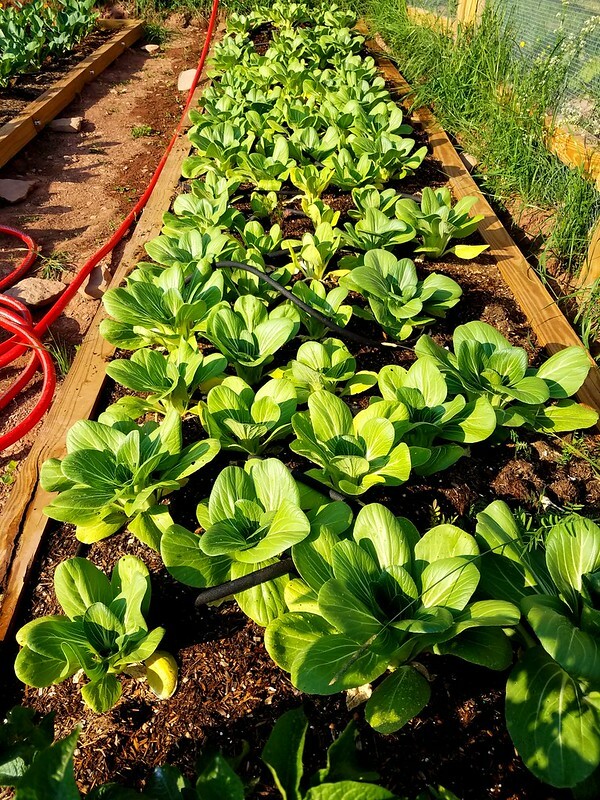 We have a entire bed of bok choy plants, we started picking fuller plants 3 weeks ago, and they are just growing and growing and growing. 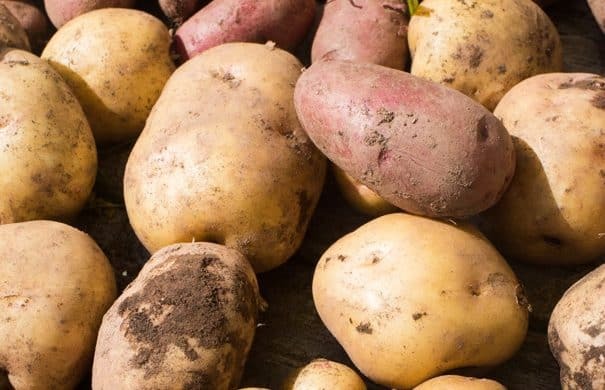 And I’m picking, picking, picking. Beep, Beep, the plant car is here! Jump on it if you can find a spot. And be careful for the rose bushes! While the vegetables are growing in the garden, this past weekend we headed to Lowe’s to pretty much buy all their fruit bushes and Rhododendron plants that they had. 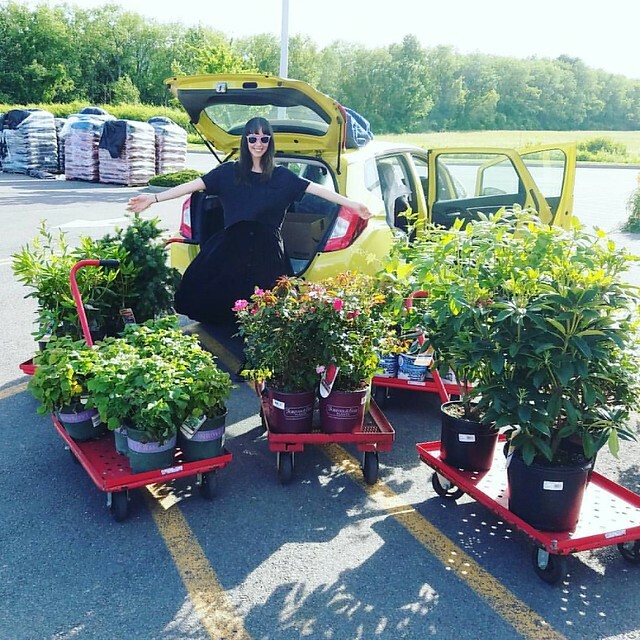 We had 5 big garden carts filled with berries, trees and flowers going down the checkout aisle, while people marveled on how we were going to fit it into our tiny little car. 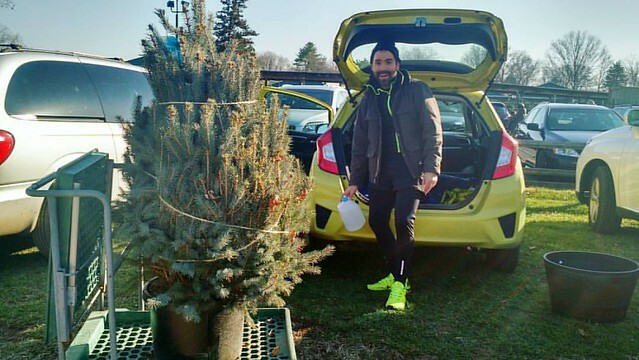 Our small neon yellow Honda Fit has carried quite a lot since we got it in the Fall, people are always amazed by how much it can carry! 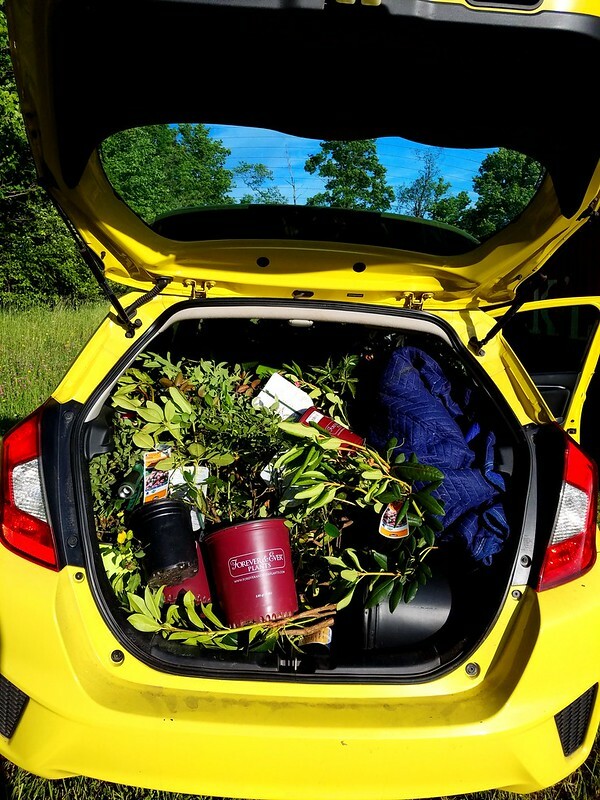 I’m not sure if we could have fit any more plants in it, branches were literally reaching out and tickling our noses in the front seat. Do you think we got enough plants? How to Build a Rainwater Catchment On a Shed Roof. It’s easy to attach gutters onto your shed roof to collect water for your vegetable garden. We decided we were going to add a few rain barrels on the land to collect water for the garden. We are trying to be “off the grid” as much as possible for this adventure so it made sense to us to try to catch all the free water we could. For this, we built a shed in the garden and added gutters to it to collect water into the rain barrels. In just a few days we collected a full 50 gallons of water into one barrel, so it was a big success! Now we hope that it rains every week so we can get a full 100 gallons to water our plants with. Here’s a rain barrel calculator if you want to see how much rain you can collect. First, we built a shed This is the 7×7 Rubbermaid Roughneck Gable Storage Shed that we got from Lowe’s to place into the the garden. It was easy to put together as you can see in our time-lapse video. We bought cheap vinyl gutters and mounted them to our shed with gutter mounts. The most difficult part was the mounting of the gutter hangers. For this we used machine screws to install the gutter hangers on the shed by drilling through the shed wall and fastening the machine screws with washers and a nut. 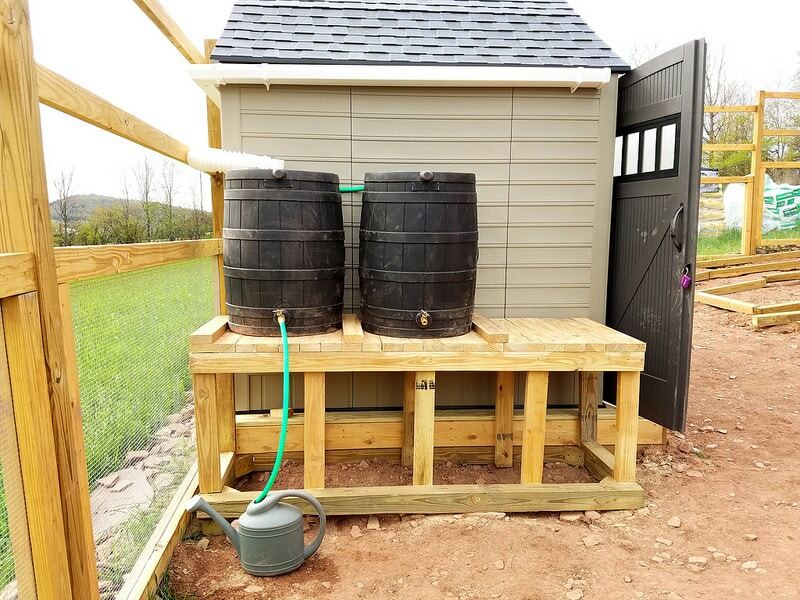 We used a gutter end with a drop at the back of the shed to funnel the water down and then some flex spout to direct the water right into the rain barrels. 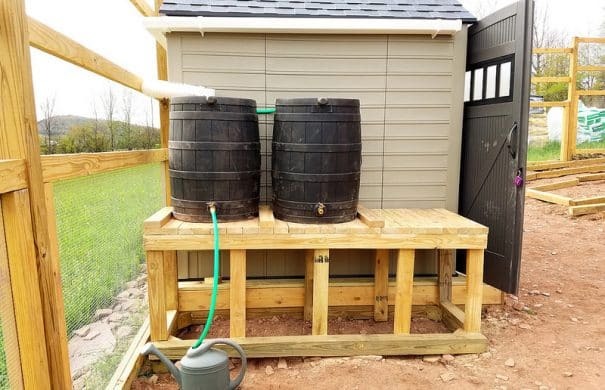 The rain barrels are connected to each other in the back with a small hose that we cut. Once one barrel fills up, then the hose will transfer water to the 2nd barrel until they are both full. Hey Mark, if we decide to go that route, we would do concrete pylons. Delivery of our first shipping container to build our tiny house in Upstate New York! This post shows pricing and delivery info. We’ve been so busy Upstate over the last few months! This weekend we put down the wood for the garden boxes, but before I get there, I have to backup a few months because I have a few posts to catch up on. 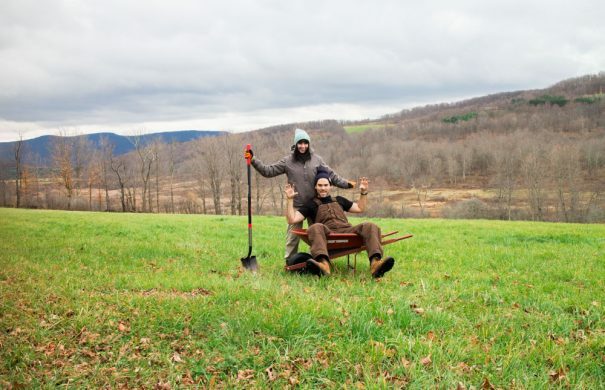 If you aren’t following long, Matthew and I bought land in Upstate NY where we’re building a weekend getaway. First up – the first shipping container arrived! You might have read in the original post but Matthew and I have dreams of building a shipping container vacation home one day. 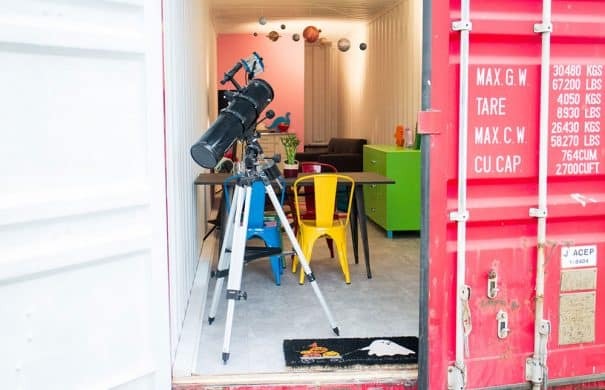 A shipping container home is literally a home made out of recycled shipping containers. Shipping containers travel around the world by ocean delivering all sorts of things. You can buy them used, or one use, and they come wind and water tight so they are pretty strong and long lasting. Shipping containers are a great option in building something environmentally sustainable as you’ll be reusing. A bonus is that they look pretty cool. If you’ve never seen a shipping container home or are confused by what I’m talking about, click here to check out photos. 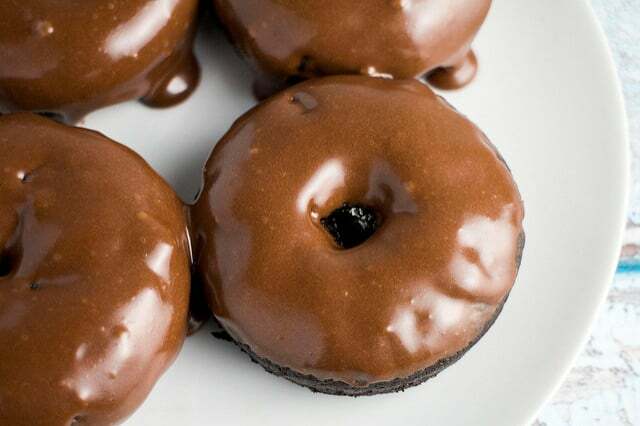 Beautiful, aren’t they? What’s the ultimate goal? We’re not sure. Will the future home be made out of shipping containers or will it just have that aesthetic? We’re not sure, but we wanted to start the wheels turning in the shipping container direction. Since we just have land, and we’re building the garden, we needed safe storage for tools, wood and other supplies. 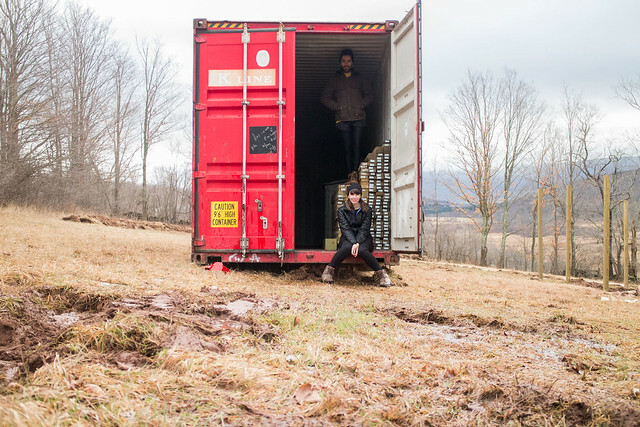 It made sense to us to start thinking about getting a shipping container as it could be #1 container for our future Upstate home, while acting as a sturdy storage container in the meantime. If we decide we don’t want to do a shipping container home, it will probably end up as extra cool guest house one day. So either way, we’ll be giving this container a new life to live. We stated talking about shipping containers a while ago and I’ve been pricing them for about a year. Your best bet is buying them off a shipping container company who has direct ties to the ports, since they’ll literally be coming off the ocean, on to a flatbed truck and then delivered to wherever you are. I priced around with a few different companies and was surprised to see prices were all so different. I’m glad I did my price check because we ended up saving thousands of dollars. Also, I learned that prices of shipping containers literally change from week to week depending on how many they have at the ports. With that said, availability also changes depending on what size you want. Shipping containers come in all sizes, with the most popular models being 20 or 40 feet long (they’re 8 feet wide). 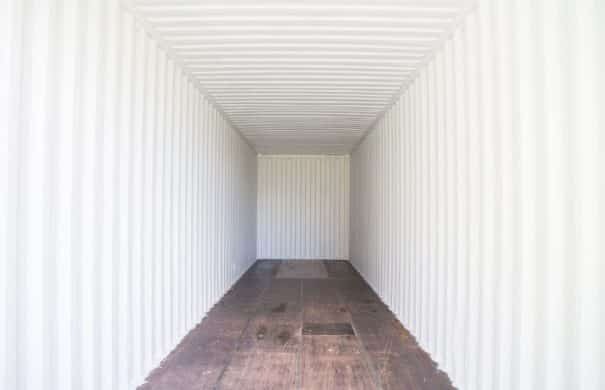 We wanted a 40 foot container, but we also wanted a high ceiling container, so we were looking for a 40 foot high cube container which is 9.6 feet tall. Tall containers aren’t as easy to find, but they also aren’t hard. Most likely a popular port will have some high containers, or they’ll be easy enough to track down. We also went the route of getting a used container instead of getting a brand new one to save even a few more thousand dollars. We were worried we were going to regret getting a used one, but in the end it all worked out and I wouldn’t have done it differently. The container looks more worn than a brand new one, but once it’s fixed up inside and outside, I’m not sure if justifies the extra money if you’re on a budget. We bought our container off modalART which was a good choice. If you’re looking for a container, I’d recommend them. We’ll definitely use them again if we buy a few more (ultimate goal is to have a 2-3 story container house). They were easy to work with, as well as recommending us trusted trailer delivery services. 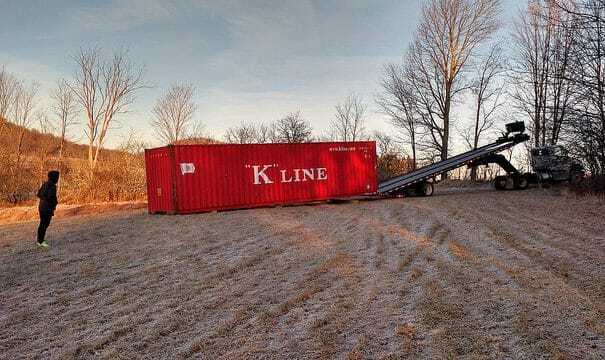 Shipping containers are huge and they’re made out of steel, so you’re going to need a trailer to deliver them. Keep this in mind when budgeting as this is a significant cost. It cost $1100 to deliver the container from the port in Newark NJ to Upstate NY. If you’re going to buying a few containers, then it’s that price x container as you need a truck per container. So no more chatting… here comes the first one! Remember I posted about the garden shivers on Monday? That feeling you get when you’re so excited about the upcoming garden season, you shake from happiness? Yeah. I got the garden shivers bad. I’m so excited.. I just can’t hide it.. I’m about to lose my mind and plant way too much corn! 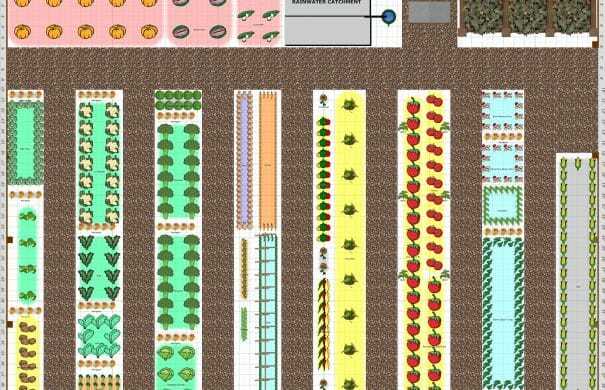 Knowing that we have to get our seeds planted soon, and being affected by the garden shivers at a very high rate, we sat down this week to plan the garden. This is not 100% firm as things change once you are in the garden space, but it’s pretty close to what we’ll do. Hope you had a great weekend! What did you do? We spent Saturday in the studio working but on Sunday we decided to make a quick day trip to the land to check in on things as it’s been a month since our last visit. We wanted to drop some things off to get ready for building! 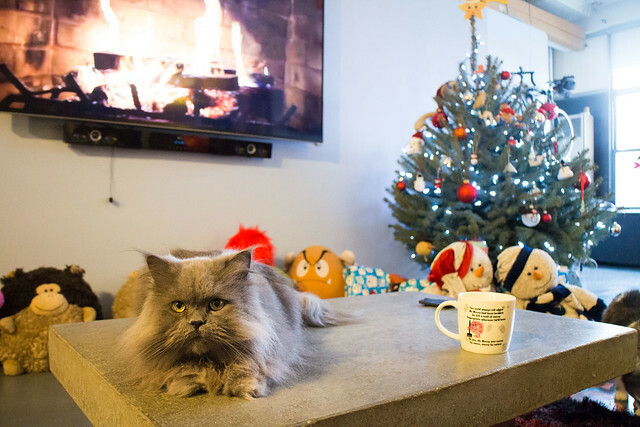 First, a quick update on Mister Christmas Tree! We planted him a month ago and I’ve been worried sick about him. So far he looks good! I don’t think we’ll know until Spring if he’s in the clear, but for now he looks great. We gave him a great big hug. I got a bunch of cameras to set up on the land so I can check out the wildlife when I’m not there. For some reason the deer and bunnies don’t stop and visit me when I’m there. It really breaks my heart. 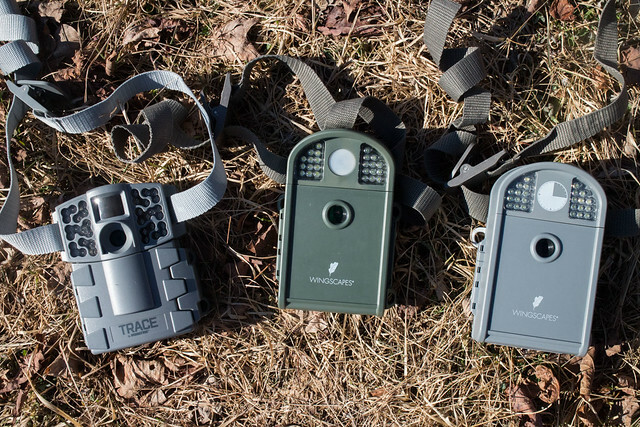 The cameras are Trace and Wingscapes (which are built on Moultrie technology). I have 2 cameras that are motion activated (wildlife and security) and one camera that will be doing a time lapse on the land. I can’t wait to use the time lapse camera for the garden once it’s up and running. I’ll be checking the cameras every time I visit so hope for some exciting animal photos! Expect full posts on the cameras once I have some photos! 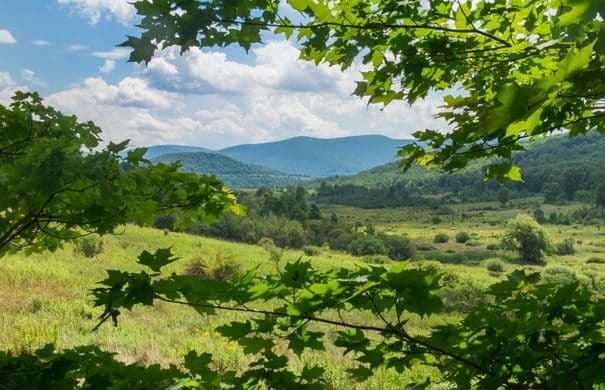 Click here to follow along with our entire Upstate Adventure! 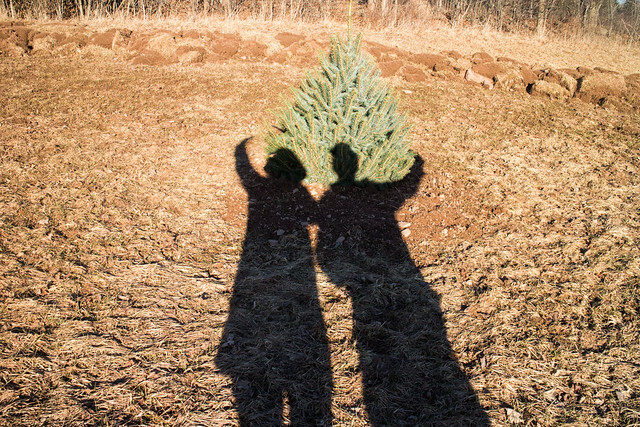 This year when it was Christmas tree time we decided that we were going to start a new tradition. 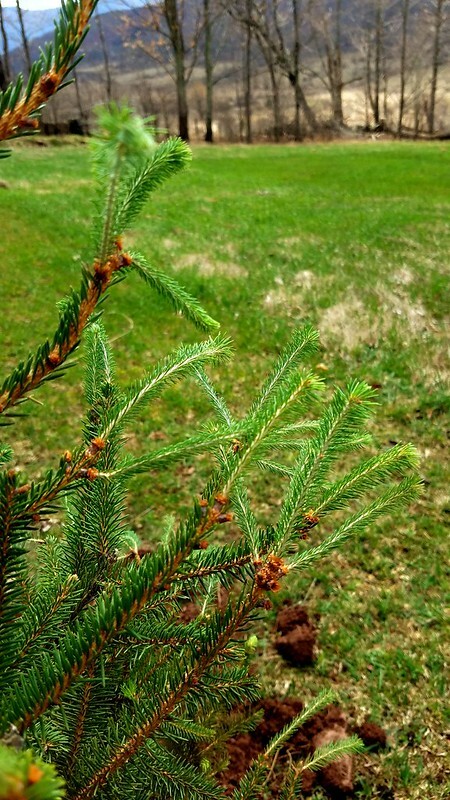 We would find a live tree, keep it for Christmas and then plant it on our land. Our hope is that we repeat, repeat, repeat, repeat (…) for a long time so that we eventually have a family of trees on the land that are both beautiful and hold special memories. 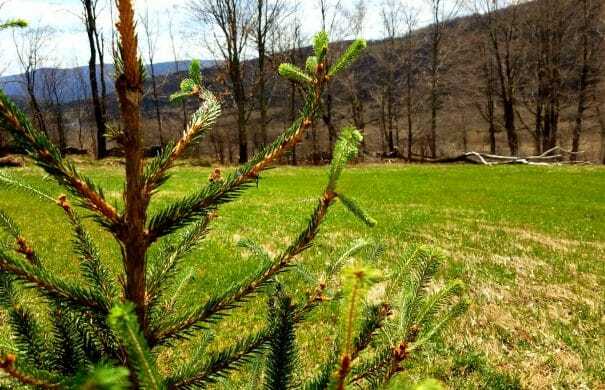 After I called multiple farms and struck out, I found a nursery in Long Island that sold live Colorado Blue Spruce trees with the ball still attached. So we drove out there, picked a favorite and loaded him into the car! Our little car by the way has carried alot in it’s short life so far. There he stayed for a few weeks while we dressed him up and cats slept nearby. A few days after Christmas we started to plan to take him (it’s a boy) to the land but the temperature difference between inside and outside Upstate NY would be a big shock so we had to harden him off (just like seedlings). We wrapped him up and took him to the stairwell of the roof to start getting used to the chill. He stayed there for 5 days before moving him to his final destination. 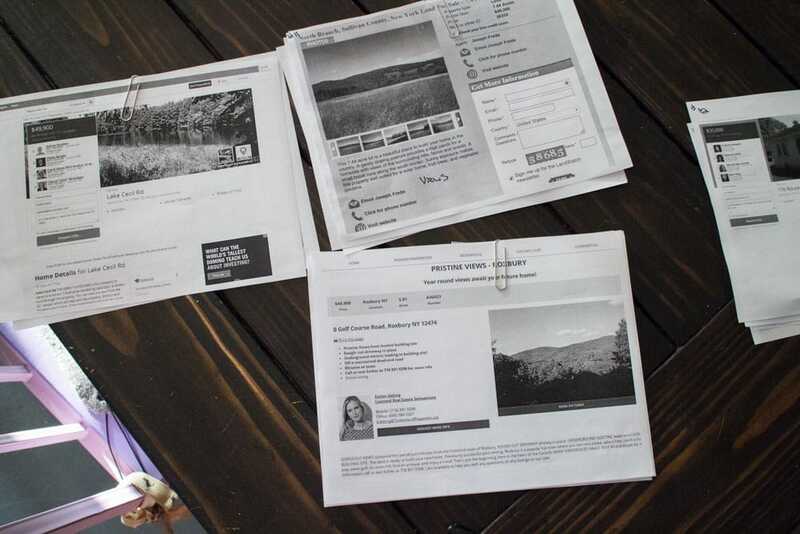 In case you missed it, Matthew and I bought land in Upstate NY! You can follow the entire series here. Now we’re ready to work! Buying land was the result of wanting a garden that came with no rules. 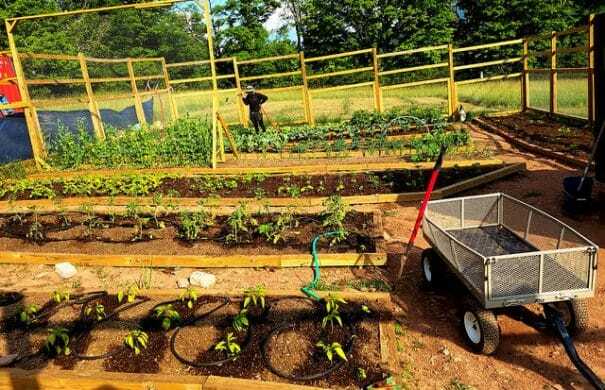 So it’s no surprise that the first thing to build on the land is a garden! It’s funny to think about where the garden started from. In 2009 it was 32 square feet and then it became a few hundred square feet, getting bigger by the year. Now it has a few acres to grow! 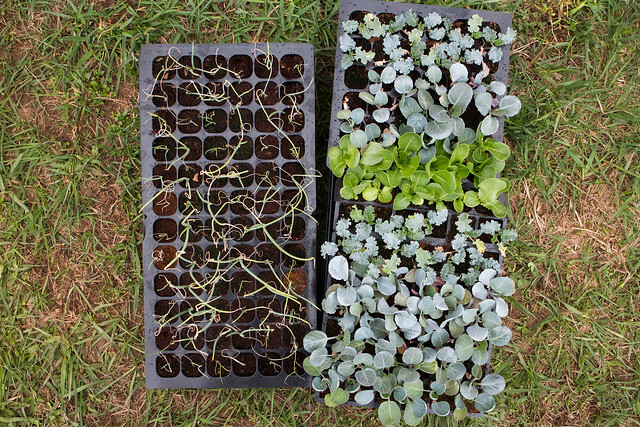 The future garden is 56×40. That’s huge! We started smaller but I complained it wasn’t big enough so we expanded another few feet (thanks Matthew!). Now that I can stand inside the garden space I realize how big it is and how many plants it would take to fill up the area. Maybe I went a little crazy, but at least we have room to grow! It’s hard to figure out what steps to do first when you’re starting from the beginning (and in Winter). I suppose our steps could have been in a different order to make things easier on us, but with us spending sporadic weekends up there and wanting to use the equipment when we have it to avoid extra rental day costs we’re doing things as we can. 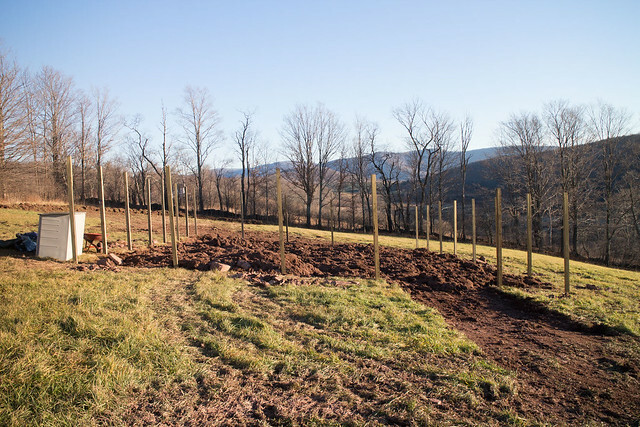 For example, over Thanksgiving we put in the fence posts because the weather was nice and we had a free weekend. Now that the posts are up, there’s no way a truck is going to be able to empty soil/compost into it easily when Spring is here. That means they will have to dump it nearby and we’ll have to move it into the garden ourselves. It’s extra work, but we think in the end it’s going to make the process completed quicker. Plus to be honest, the process is sometimes much more fun than the complete project. With the garden being the first thing we want completed we wanted to get a jump on turning the soil. We rented a skid steer for a weekend to remove the top layer of grass and turn the soil under neath. We are in the Catskills so we knew it was going to be rocky but we weren’t sure how rocky it was going to be. Our land is former farm land, but it sure is rocky too. Over the next few visits we’ll be removing as many as the rocks as we can. There’s lots of rocks. I guestimated millions. There’s no way we are going to be able to remove all the rocks, but there are some big ones (that I can’t even lift) that need to be removed as well as endless smaller ones. The goal is for every rock that’s larger than a tennis ball to be removed. You might think this sounds easy, but there’s tons of rocks and we dug deep to turn the soil… so rocks are everywhere. I see them in my nightmares! I tried to find a easier way to do this but without some heavy duty farm equipment, it seems by rake and hand is easiest. You’ll see me sitting in the dirt often in the next few months. It might look like I’m not doing anything but I really am! I’m going to become a expert rock picker. The rocks are going to be used to line the exterior of the garden too, we’re trying to give back to the land whatever we dig up. 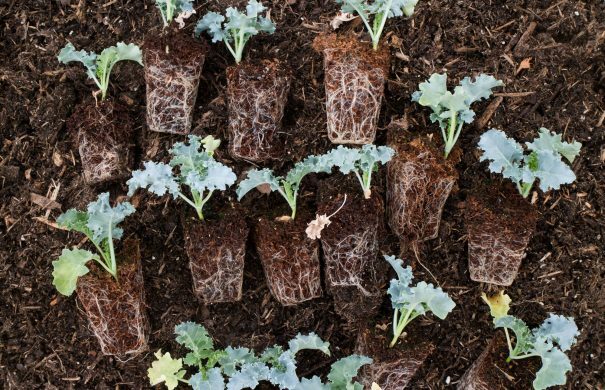 We think lining the outside of the garden with rocks will help keep pests from digging into the garden. Since we won’t be able to guard the garden on a daily basis we’re trying to protect it however we can. It’s going to be a learning process with some heartbreak involved. In the pictures below you’ll see our garden posts up. I’ll be doing a whole series on how we built our garden fence. Right now the fence posts are in (hard work). Next, the fencing material and wood needs to be attached to make a complete fence. This is going to take time, some friends and some hopeful warmer days. I’ll be documenting all the steps so by end of Spring you should see a entire DIY fence post coming! Now let’s first see the damage we did over the weekend.